Fat Chance Bellydance director, Carolena Nericcio is the creator of the modern bellydance style called American Tribal Style (ATS). 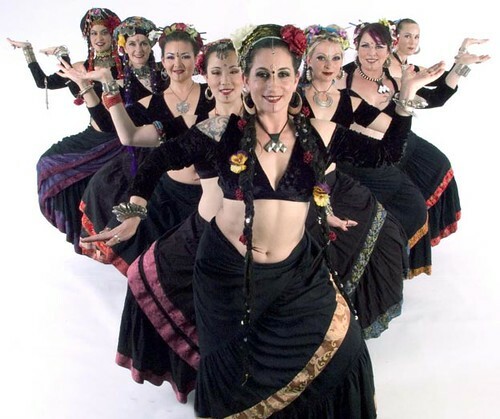 After dancing with the Classic Dance Troupe of San Francisco for several years, in 1987 carolena began teaching people bellydance so that she could have dance partners. Being young and tattooed, she attracted people living alternative lifestyles with tattoos and almost primitive-like styles. Basically, people that were tattooed and wearing dreads…those that some say are part of sort of “subculture”. Carolena and her students became well know by performing for tattoo shows and conventions all around the Bay. Although at first, their style seemed to be shunned by many for departing so far away from tradition, but today, the style is very well accepted and many find it fascinating to watch these dancers perform with such a “tribal” edge. Rachel Brice is another local Tribal Fusion Belly Dancer based out of San Francisco. She is the artist director and choreographer for The indigo Belly Dance Company and she also frequently performs with the Bellydance Superstars. Her Teachers include Fat Chance Bellydance Creator, Carolina Nericcio, Gary Kraftsow and Jamila and Suhaila Salimpour. She has performed and toured internationally since 1990 and been on a ton of tv and radio appearances worldwide. She has put out fitness videos focusing on Yoga and Bellydance and has given workshops all over America and Europe. Kind of an interesting random thing about Rachel is, she teaches Yoga and Belly Dance for Pixar Animation Studios. Jamila Salimpour influenced hundreds of dancers and musicians over the past 50 years. Know for demystying middle eastern movement, and finger cymbals created foundation for new dance language. Throughtout the jamila continued to study middle eastern dance and by the early 1950’s was appearing in ethnic nightclubs down in LA. She would also dance at the famous club she owned in San Francisco, called The Baghdad Cabaret; the first woman to own a Middle Eastern club in California. By 1949, Jamila had begun designing her own breakdown and teminolgy of Bellydance movements, including the Turkish Drop, Maya to the Floor, and Basic Egyptian to add structure and definition to the dance. She married a Persian drummer in the 1950’s who later swore that he would brake both her legs if she ever danced in public again. She also soon discovered that cymbal playing in the house was not allowed either. Although they would later divorce, In 1966 they had a beautiful daughter named Suhaila Salimpour, who would later become a top dance star. When she discovered the outdoor renessance fairs, she decided to form her own version of middle eastern entertainment involving live music, swords, snakes and tattoos. it was very different from the usual cabaret night scene and Jamila named her dance company Bal Anat; Dance of the Mother Goddess. She also referred to it a tribal or ethnic style, as it was known by many at the time. The look and format was perfect for fairs, museums, and places where families gathered. The video below gives a perfect understanding of Jamila and how she became who she is today. She gave way to so many women and gave women freedom to be who they wanted to be, all through the style of dance. Suhaila Salimpour is a highly acclaimed performer, teacher, and choreographer of belly dance. Growing up in the Bay Area, she loved the feeling she had when she would dance close to her mother, Jamila Salimpour, as they shared a dance. She was classically trained at an early age in Jazz, Tap and Ballet. Her first breakthrough was when she took what she knew from her Classical background and integrated it with her traditional background of Bellydance that her mother taught her. The result was a true artistic breakthrough, a revolutionary foundational technique that has brought the art of Belly Dance to a new level. Today, Suhaila teachers out of her studio in Berkeley, California with a unique style that has prepared her to become one of the worlds finest and most sought after performers. Her performances expressed the emotional soul and rhythm of ancient dance with the discipline and structured movement of the modern era. As Suhaila’s reputation grew she began to perform her unique art form all over the United States and Europe and her reception in the Middle East was astonishing; she was frequently compared in the media to some of the greatest dancers in the entire Arab world and has been featured in shows with the most renowned singers in the Middle East. She has also choreographed American rock videos, using a combination of her jazz and Middle Eastern training and her unique artistic vision which can be seen in her second-generation company, The Suhaila Salimpour Dance Company. In 2000, she revived her mother’s famous tribal dance company Bal Anat which was the first tribal dance company in the World. Suhaila tours America, Canada and Europe, giving workshops and concerts under her company and has finalized the first certification program available for Middle Eastern Dance. She creates instructional and performance videos for all dance levels, as well as fully-orchestrated Middle Eastern dance musicals and CD recordings of the latest percussion artists. Today, her aim is to watch the art of bellydance grow; to ever more raise the level of her dance form.